These two look as though they had a tiff. I don’t know who started it but it’s probably safe to assume the guy on the left had the last word. 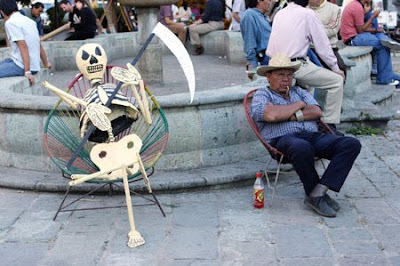 This photograph was taken during the Day of the Dead Festival in Oaxaca, Mexico. At the end of next month I’ll be heading to a different part of Mexico for this year’s Day of the Dead. Wendy, this is such a great shot. It made me feel a little homesick for Mexico. I love the old man with his beer sitting beside him. Nice! I've never been to Mexico. Would be so fun to go for that festival. Nice :) Never heard about this before! Monna, I can see why you'd miss Mexico so much. Anne, I bet you would love it. Mexico is such a visual country. Priyank, Day of the Dead is a lovely, spiritual way to honor those who have passed on. But a nice way to remember our forefathers. I guess each country has something or the other. It is important to remember people who are no more with us. I've always wanted to go to the day of the dead in mexico.....it seems like a right good time..
What i love about Day of the Dead is how families come together and it is not a morose affair. It's celebrating loved ones who are no longer here. Lakshmi, you manage to put some mile behind you as well. Catherine, I'll be showing up on your doorstep with a tripod in hand. Looking forward. Matt, when you are back on this side of the earth you must go. This is the third year in a row I'll be in Mexico for Day of the Dead, each time in a different place. ....I agree that it is wonderful that the Dia de los Muertos festival is not morose ~ but a celebration in honor of the loved ones who have passed on but not been forgotten ~ and that it is a good time for all the familia. I love all the tradition around this special time of the year. I am a Mexican Folk Artist and I enjoy very much painting the Day of the Dead characters ~ La Catrina is one of my favourites! But I also love to paint the Mexican Ex-voto Retablos and use the Day of the Dead skeletons! Muchas Gracias for all the fabulous stories & photos from Old Mexico!